Comment Once more some difficult moments with little trace of paths, few waymarks and a missing footbridge. Chilmington Green is unfortunately the site of another huge expansion of Ashford, but the Greensand Way should be protected back to Kingsnorth. From the Kings Head car park, cross the road to a path down the side of the end of a terrace of houses, and pass down the side of its back garden to a stile. Keep ahead along the edge of a horse paddock. At the far end turn left for a short distance, then right over a footbridge and through a metal gate into a field. Bear left uphill to a stile and footbridge. Continue uphill with a hedge on the left to a further stile. Cross into a large field. Cross the field towards Criol Farm. Reach an overgrown stile by a metal fieldgate and cross onto a road. Turn right and walk along the road to a stile on the left in a hedge just past the last of the farm buildings. Cross into a field. The path is difficult to follow here unless reinstated through crops. If not, gradually bear right away from the hedge on the left. Where this hedge turns a corner to the left, look diagonally right to two pairs of isolated trees. Head downhill towards the lefthand pair of trees and reach a stream. The path should cross the stream and continue up the other side. However there is no bridge so turn right along the stream to the end of the field. Here turn left and cross the stream by fieldgates just below the pair of trees. Walk up the field ahead with the hedge on the right, passing the trees as you do so. At the top of the rise turn right by a metal fieldgate into another large field and continue with a hedge on the left. Follow the hedge along then down to the bottom left corner of the field. Go through or over a fieldgate onto a road. Turn right along the road and, on meeting a road coming in on the left, turn up it. Keep on this road (ignore a footpath off through the hedge on the left to Great Chilmington, it was intended to use this path but the exit is blocked at the farm) until a side road comes in on the left. Here turn right into a field by the side of a house. Bear slightly left across the field to a fieldgate and impossible stile with barbed wire. Go ahead on a track which is once again the Greensand Way. At the end of the track is a permissive path going left along a stream to a waymark post. Turn right here towards a line of trees. On reaching the trees, turn left and follow the field edge to a footbridge on the right. Cross to a road by Willowbed Farm. Cross the road with care to a narrow footbridge and stile into a field. Do not go straight ahead, but bear right across the field to another footbridge with waymarks leading to a tarmac farm road. Cross this roadway to a stile into a field and bear left across to emerge onto a road. This is the line of the outward route. 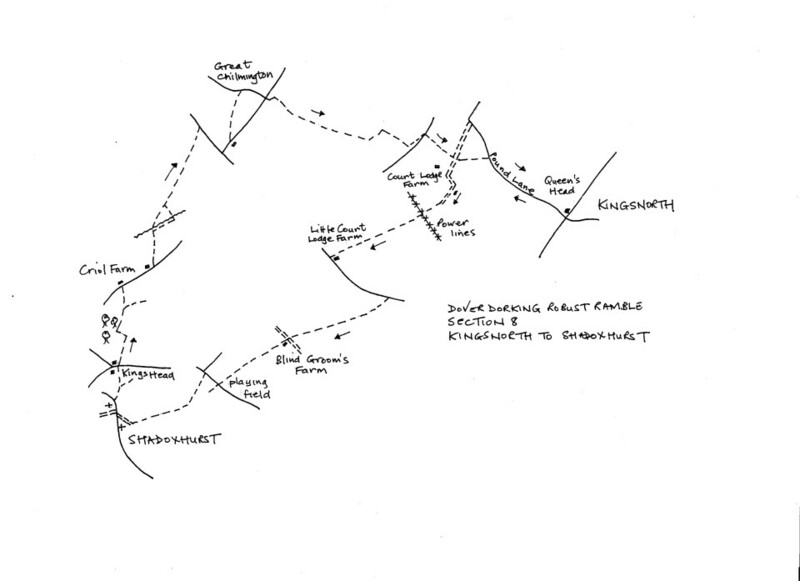 Turn right on the road to return to the Queens Head in Kingsnorth and the start of the section.